Introduced bill to award Congressional Gold Medal to Nisei vets. 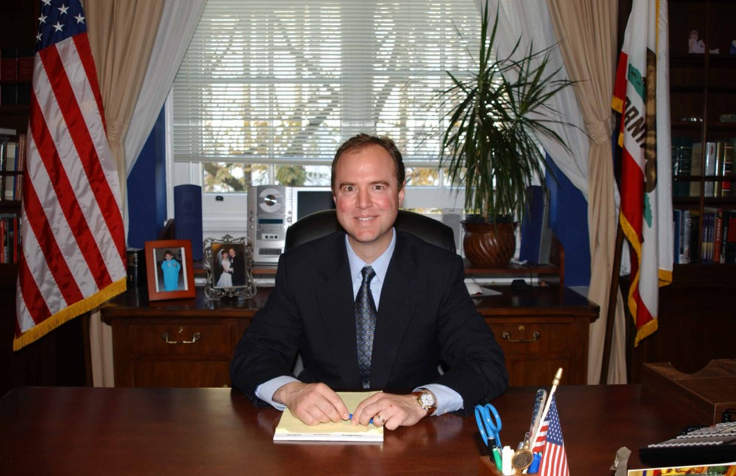 WASHINGTON — Rep. Adam Schiff (D-Pasadena will receive the Japanese American Veterans Association’s (JAVA) Courage, Honor, Patriotism Award at its spring quarterly luncheon at Harvest Moon Restaurant in Falls Church, Va., on March 14. The award recognizes Schiff’s initiative in introducing the legislation that ultimately resulted in the awarding of the Congressional Gold Medal to the 100th Infantry Battalion, 442nd Regimental Combat Team, and the Military Intelligence Service. This honor is the highest that Congress can bestow. Schiff, son of a World War II veteran, introduced H.R. 347, which passed in 2009 with nearly 300 co-sponsors. Following this, Sen. Barbara Boxer (D-Calif.) introduced her bill, S. 1055, including an amendment to add the Military Intelligence Service. The Senate bill passed on Sept. 25, 2010. President Barack Obama signed the bill into law on Oct. 5, 2010, witnessed by six Nisei veterans and other White House invitees. Over 300 Nisei veterans, most of them over 90 years of age, with about 2,500 widows and other next of kin, visited the nation’s capital for the award ceremony on Nov. 2, 2011, at the Emancipation Hall of the U.S. Congress. The hall and two theaters accommodated 1,250 attendees. The overflow crowd saw the program over a live feed at the Washington Hilton’s Columbia Hall. National viewers saw the program broadcast over commercial television networks and the Pentagon channel. Only one Congressional Gold Medal was minted by congressional mandate; however, the U.S. Mint produced replicas of the CGM in bronze, a number of which were purchased by local veterans. Also, they were bought by civic organizations that, in turn, presented them in ceremonies to the qualified veterans who were not able to make the long journey to Washington. The CGM honoring the Japanese American veterans has since completed a nationwide tour, arranged by the National Veterans Network (Christine Sato-Yamazaki, executive director), to seven locations: New Orleans, Honolulu, Los Angeles, San Francisco, Portland, Chicago and Houston. The CGM is now on display at the “Price of Freedom” exhibit at the Smithsonian National Museum of American History. To the veterans of the 100th and 442nd, the CGM, as the highest civilian award, stands out as true national recognition in addition to their military awards, which include seven Presidential Unit Citations, 21 Medals of Honor, 29 Distinguished Service Crosses, 560 Silver Stars, 22 Legion of Merit Medals, 15 Soldier’s Medals, 4,000 Bronze Stars and over 4,000 Purple Hearts. The U.S. Army has declared that the 442nd RCT, including the 100th Battalion, as the most highly decorated unit during World War II for its size and period of combat. For more information, visit http://javadc.org. 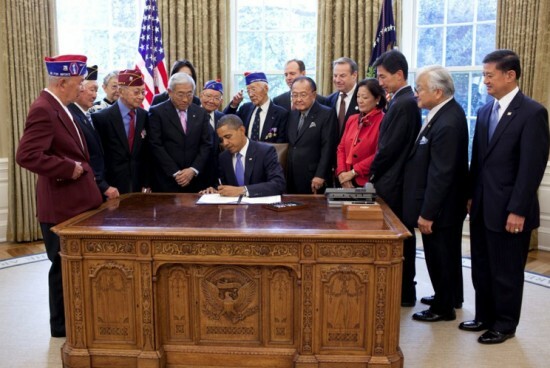 On Oct. 5, 2010, President Obama signed S. 1055, which granted the Congressional Gold Medal, collectively, to the 100th Infantry Battalion, 442nd Regimental Combat Team and Military Intelligence Service. Standing around Obama, from left: Osamu “Sam” Fujikawa, Grant Ichikawa, Lynn Kanaya (obscured), Col. Jimmie Kanaya, Floyd Mori, Christine Sato Yamazaki (obscured), Terry Shima, Kelly Kuwayama, Rep. Adam Schiff (D-Pasadena), Sen. Daniel Inouye (D-Hawaii), Rep. Bob Filner (D-San Diego), Rep. Mazie Hirono (D-Hawaii), Rep. Charles Djou (R-Hawaii), Rep. Mike Honda (D-San Jose), Secretary of Veterans Affairs Eric Shinseki.